Nathan's Famous Fourth of July International Hot Dog Eating Contest, July 2, 2009. There aren’t that many things in life that are truly great, fewer still that fit the definition of awesome, and only a handful that earn the moniker "epic." Saturday, a battle for honor and glory will take place. A battle of such proportions as to quake the knees of even the most hardened of Spartan warriors of old. The day of this battle will be May 15, the time will be 1 p.m., and the place will be Nathan’s Famous in East Hartford. 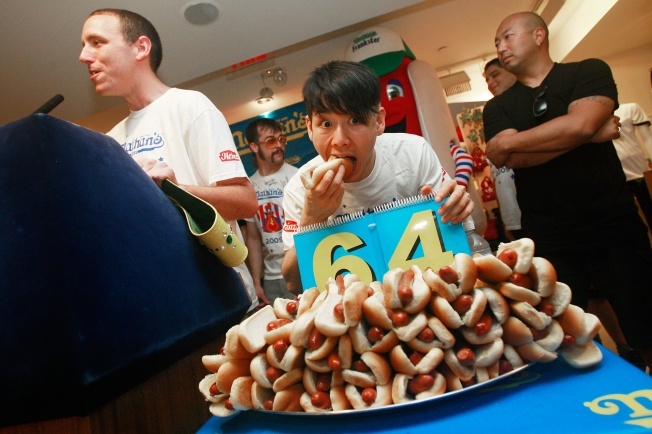 The prize will be the title of Connecticut Hot Dog Eating Champion and the honor of representing Connecticut in the Nathan’s Famous Fourth of July International Hot Dog Eating Contest in Coney Island, New York. Three of Connecticut’s most seasoned gurgitators will be participating in this modern arena of gastronomic fortitude. Seth Chickering, of New Milford, Matthew Martorelli, of Newington, and Mike LeMay, of South Windsor, will all be focused on defeating Pete “Pretty Boy” Davekos, a native of Boston and the contest favorite. Davekos is the #16-ranked Major League Eater and garlicky greens eating champion of the world. Whoever finishes the 10 minutes with the most Nathan’s Famous hot dogs in his, or her, belly will earn a spot on the ESPN-televised contest at the original Nathan’s Famous in Coney Island on July 4. The current champion is Joey Chestnut of San Jose, California, who ate a record-breaking 68 hot dogs and buns in 10 minutes. There are qualifying contests like the one in East Hartford taking place in 12 cities around the country. There will also be two qualifiers on military bases to feature our uniformed gastronomical combatants, with stomachs hardened by endlessly repetitive diets of MREs and shipboard meals. As part of the 2010 July 4th celebration, Nathan's Famous will provide 100,000 hotdogs to American troops stationed overseas.